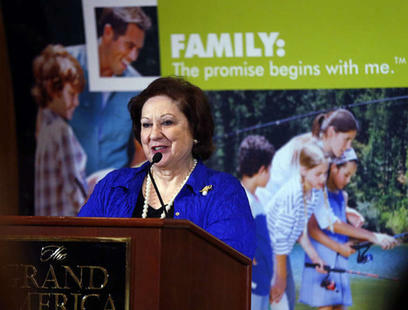 When the World Congress of Families meets in Salt Lake City in October, it will bring together scholars, religious leaders, motivational speakers, youths and media personalities to “affirm, celebrate, and encourage the natural family” — defined on the Congress website as a family centered around marriage between a man and woman. Elder M. Russell Ballard, a member of the Quorum of the Twelve Apostles of The Church of Jesus Christ of Latter-day Saints, will be a keynote speaker at the opening session. The 2,500 expected conference participants will hear from 200 speakers, many of whom are key figures in religion and family scholarship. Yet the conference, scheduled Oct. 27-30, has been met with protest and controversy by critics who claim the congress is an attack on the LGBT community and worthy of condemnation. Last August, the Australian Senate passed a motion calling for federal ministers to boycott a World Congress of Families gathering in Melbourne and about 100 demonstrators blocked the entrance to the event. The year before, lesbian, gay, bisexual and transgender activists accused the World Congress of Families of supporting a Russian law that banned the distribution of LGBT “propaganda” to minors. The conference, which was scheduled to take place at the Kremlin, was ultimately canceled after Russia annexed Crimea. Now, in the runup to the World Congress of Families IX — the first congress to be hosted in an American city — organizers are continuing to face criticism. The WCF essentially aims at promoting a family model that guarantees that a child will be raised in a stable and loving environment made up of a father and mother dedicated to each-other and to their children. Stating that such manifestations are an expression of hate towards the LGBT community - as if the "Father Knows Best" 50's series had been specifically designed to attack Gay people - will only result in LGBT Activists being eventually perceived as a threat towards anyone whose life-styles and values differ from theirs. I hope that someone at this family conference is willing to present the statistics on AIDS/HIV in the US. Since 1980 over 500,000 people have died and today over a million are infected. The main cause of this is directly attributed to the gay lifestyle.